Hello, everybody! Yesterday I was cruising internet and found a picture of an adorable Princess Jasmine's costume (in Disneyland). So I decided to put all my talent and afford (mostly ) to make my first recolour ever. And retexture as well! I hope I did not hurt Denise's (the mesh's creator) rights in anyway and hope she will like my work. 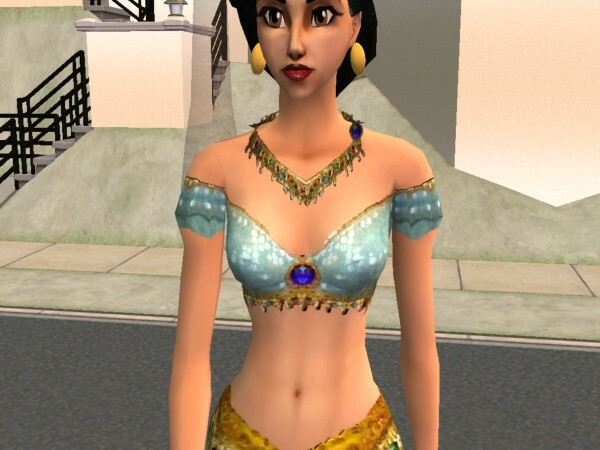 I simply adore all her Disney-looking sims and Jasmine is my forever-favourite princess of Disney! This costume is dedicated to my little daughter, Jasmine too, who died half year ago. God be with you dearest, your mom and dad will always remember and love you endlessly! P.S. Necklace in the pictures is comming with my next upload! To Denise for the mesh and the whole bunch of Disney characters, that now hang around in my neighbourhood! Without you even the idea of this creation would be impossible. Thank you for your art because you bring even more magic into far-from-being-realistic game of my life!